Whether the model has Bluetooth, surfs the web, or comes in bright pink might all be pressing considerations when looking to buy a new mobile phone, but arguably the most significant decision you must make is whether to opt for a ‘pay as you go’ device or sign up for contract. Many people would scoff at such a suggestion – free minutes and texts, the latest technology for bargain prices; there is no question a contract phone is the way to go, they may declare. And they might be right, at least for some people. But many others, who would actually be better off with a pay as you go, are lured into a contract by the dazzling array of offers the mobile companies use to entice customers. In many ways it’s a simple decision to make. If you are likely to use your new phone frequently then a contract would suit you better, whereas as if you only plan to use your phone occasionally then a pay as you go would be more appropriate. Unfortunately it isn’t as clear cut as that. There aren’t just two distinct camps – most people are somewhere in-between, basically uncertain about how much they’re going to use their new mobile phones. And so mobile operators will therefore pull every promotional trick – be it free minutes, texts, the latest features and designs - to convince them that a contract deal is for them. No one is trying to pull them the other way, of course, because it is contracts that rake in the profits. But surely then there must be lots of people who are lured in by the perks of a contract but then find that they don’t use their phone very much, and so opt out once their contract runs out? There are some certainly, but remarkably few. Most develop a mobile phone habit and quickly find they become completely reliant on it. Even those who never really used a phone much before, suddenly find they can’t live without their beloved mobile. The free minutes and the free texts are there not only to draw the customer in but to encourage them to get friendly with their new phone. If I get a hundred free texts every month then I might as well use them, you naturally think. Within in no time you’ve built up frequent texting relationships with friends and family; you’re expected to text when you’re running late, there’s a change of plan, it’s somebody’s birthday etc. The bill you receive every month gives you a good opportunity to review your new expense. For some it might highlight what good value your gadget is proving. Just think of all those critical business calls, the calls to my parents, the texts that have helped organise my social life. Basically the phone has saved me a lot of money because I would have had to have done all those things anyway. However, if others stop to think about the costs they are running up every month, they may reach the conclusion that if they’re being honest a lot of money is being wasted. Only a few of those calls and texts were necessary. 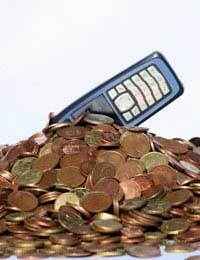 They may well have been ‘free’ but as the bill attests, maintaining a contact mobile certainly isn’t; it can amount to hundreds of pounds over the space of a 12-month contract. The big advantage to pay as you go is that it puts a cap on excessive and unnecessary spending. By paying up front you are forced to think about the necessity of every call you make. Is it really worth paying to hear about the gossip from last night when I’ll see my friend tomorrow? It’s easy to be lulled into thinking it is when direct debit will take care of any cost when the time comes. With pay as you go you are a completely free agent. You don’t have to worry about a monthly bill, or have to pay rental charges. You’re not tied to a contract where you have to pay a standard fee every month regardless whether you use the phone or not, and which you can’t escape from until 12 months is up. But, of course, with pay as you go you don’t get the great deals on the flashy new phone upgrades. If you want the latest model then you have to pay the full RRP for it. The call and text costs are typically higher than on a contract, and you don’t get all those free minutes, texts and various other perks you have with a contract deal.